Whenever I come across good horror, I want to pick it apart so I can make my own stories scarier. 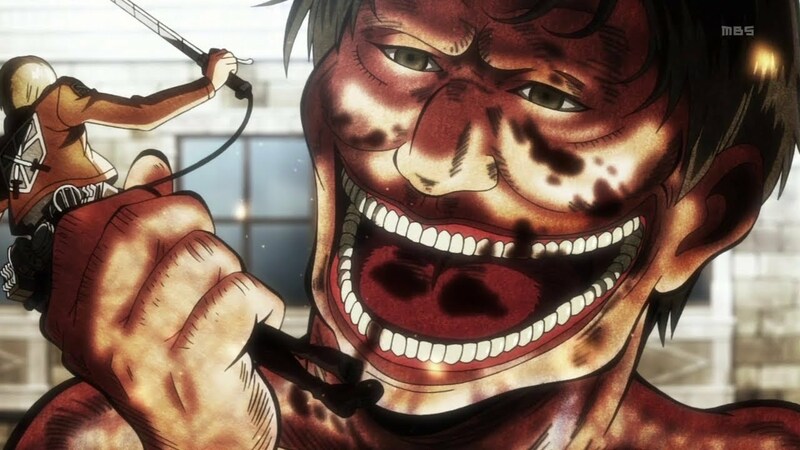 Attack on Titan isn't strictly horror but it's got the elements. The end of episode 1 in the new season freaked me out. I don't usually get that creeped out, especially not by a show. When something does affect me, I find it fascinating. I want to know why it's different. For those who don't know, Attack on Titian is an anime set in a dystopian world. Humans live behind tall walls because man-eating Titians roam the world. Season one began with a Titan breaking through one of the walls and destroying an entire town. I'm the last person to say gore is scary because generally, it's not. There's something cringe-worthy about watching a person get eaten, though. But, I've watched zombie movies without flinching. What's so disturbing about Attack on Titan? Just the way the Titans look, move, eat...it give me the willies. I read something awhile ago that talk about why people found things like clowns and dolls so terrifying. They look human but their appearance is off. For clowns, it's the make-up. 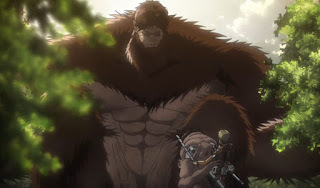 Titans look like giant, naked humans with something off about their appearance... besides behind huge. They're much creepier than zombies. It also could be I've gotten used to zombies that they don't affect me anymore. Man-eating Titans are a new terror. It's humans against giants. The humans' main weapons are basically blades and equipment that get them close to the Titans. They're at a disadvantage. Humans have cannons but those weapons are stationary. The feeling of being powerless is all throughout horror, especially haunted house stories. The person or family is being hunted by something but they can't do a thing about them. Or, they try to fight but in the end, they still lose. 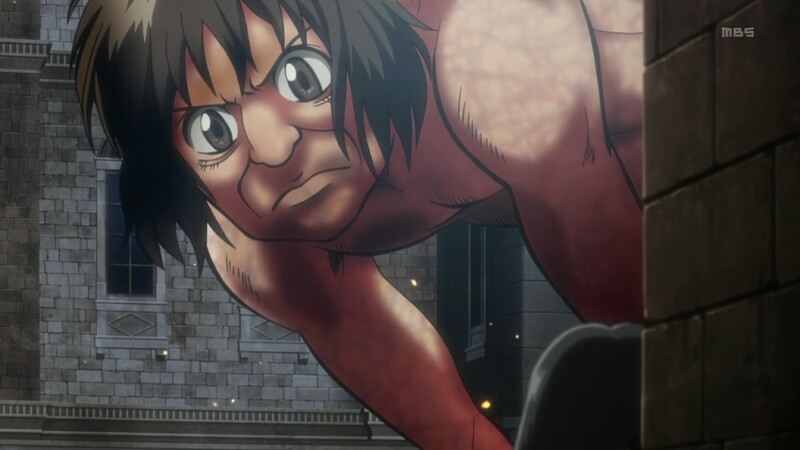 In Attack on Titan, the characters begin at a disadvantage. Then, they keep encountering new, stronger Titans. Most people think of horror as ghosts or serial killers. The genre is a bit vague. Horror aims to create fear, dread or disgust in the viewer/reader. 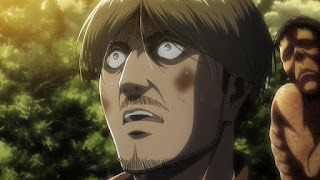 In Attack on Titan, the look on the characters' faces when they encounter a Titan... you can feel the fear. The story built the Titans to be these nearly unstoppable monsters. At first, they just look silly. Then you learn their true terror and they're not so silly anymore. We see how the characters become froze at the mere sight of them. We feel their fear and that's what makes a scene scary. Don't just give me a monster, show me why I should be afraid of it. Also, Attack on Titan is like Game of Thrones in the way it treats its characters. We don't know who will live. No one is safe. That creates dread in the viewer and the character. Can it be a good horror story without memorable or even likable characters? Sure. I watched this movie with two annoying main characters. The story was creepy enough to hold my interest. I think a good horror story should get you invested in the characters, though. That's where the fear and dread come it. The story makes you like the characters then puts them in danger. Attack on Titan does this...a little too often for my poor heart. Yeah, I can't turn my writer brain off. When I find an interesting story, I have to pick it apart to find out why. Anyone watching any good anime?